VIPAccessEXCLUSIVE: Alexisjoyvipaccess Covers Sally Miller And Sweety High’s “Shop With The Stars” Event – Recap Here! The holidays are right around the corner and ’tis the season to be oh, so jolly with so many amazing holiday gifts that are calling your name. Well, we know a gift that is at the top of everyone’s wish lists and if you’ve been nice this year, then Santa may just be dropping off a very special and super stylish holiday gift your way. One of the most chic and trendy fashion brands has brought out a spectacular line of dresses, tops, skirts, and many more terrific items for tween and teen girls to rock and you’re totally going to want to head on over to get yourself just about every item you see. We’re talking about the one and only Sally Miller fashion brand – aka every girl’s fashion obsession. Sally Miller is definitely a name that you’ve heard multiple times before whenever your favorite celebrities are walking the carpet and asked who they are wearing at the event. 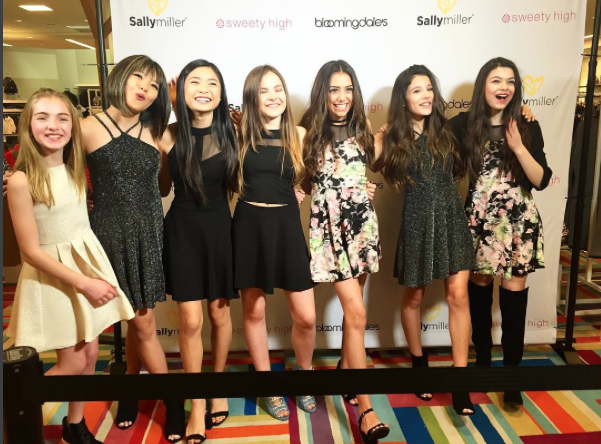 Familiar faces including Aubrey Miller, Francesca Capaldi, Nia Sioux, Nikki Hahn, Kendall Vertes, and many more have been spotted rocking Sally Miller dresses on the red carpet and even are the faces of this fabulous fashion brand as they model the dresses for the brand’s online website. From spectacular and stunning dresses such as “The Eve Dress” which is a perfect dress to ring in the new year, or “The Jane Dress” (every girl needs their little black dress! ), we could never pick our favorite item from Sally Miller’s collection as we love everything! Sally Miller’s line of clothing looks oh, so classy and elegant and allows girls to feel confident in whatever they wear and radiate their inner and outer beauty. Sally Miller, along with Sweety High, hosted a special “Shop With The Stars” event yesterday, December 10, 2016 at the Bloomingdales at the Century City Mall in Los Angeles, California. The outstanding event allowed fans to get up close and personal with some lovely ladies at the event and “Shop With The Stars.” Such a terrific opportunity as we know it’s every person’s dream to be able to shop ’til they drop with their favorite celebs. Many celebrities came to show their love and support towards the fashion line including Francesca Capaldi, Lauren Orlando, Nikki Hahn, Ashley Liao, Jillian Shea Spaeder, Ashlund Jade, Bailey Sok, and Chiara Aurelia. The wonderful event had a great DJ with tons of fantastic music that attendees were able to enjoy as they bought all of their incredible goodies. In addition to the amazing dresses, another exceptional thing about this event is that for every dress bought, Sally Miller will donate one dress to K.I.D.S / Fashion Delivers, which is an organization that helps give clothes to less fortunate families. It’s such a magnificent event that celebrates fashion but also the importance of giving back! I, Alexisjoyvipaccess had a terrific time covering Sally Miller and Sweety High’s “Shop With The Stars” event. Check out some VIPAccessEXCLUSIVE pictures below from my coverage of the event and stay tuned on YouTube.com/alexisjoyvipaccess for interviews with some of your favorite celebs from the event. Be sure to stay connected with Sally Miller’s fashion brand by following @SallyMillerFash on Twitter and Instagram and join in on the conversation by using #LASallySquad! Previous VIPAccessEXCLUSIVE: The Amazing Aidan Miner Interview With Alexisjoyvipaccess At The Skechers Pier To Pier Walk! Next VIPAccessEXCLUSIVE: X Ambassadors Had A Moving Performance At Interscope Records’ Wear.Music Pop-Up Store – Recap Here!